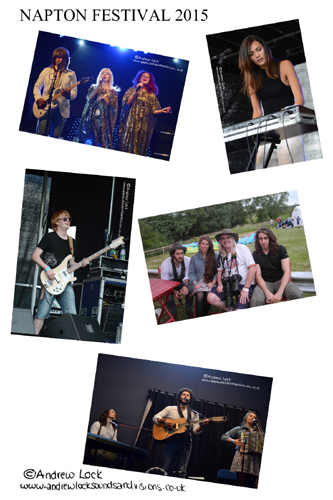 Late afternoon and the evening this year at the Napton Festival included main stage wise a polished stylish set by Jessica Rhodes and a rocking set by another band returning from last year Derecho with their dynamic female vocalist. The main stage closed with firstly mod/rockers Vendettas bringing their Jam and Who meets Oasis energy to the festival and getting the dancing underway near the stage (also loved the kids invading the stage and playing the instruments at the end) and front of stage remained busy for this years headline act Abba Chique bringing the glamour and hits of the pop giants to life. Must also mention that one of last years standout acts played one of the sets of the festival again with a faultless performance to close the acoustic stage, family three-piece the Robinson Stone Brothers are for me as good as anyone at what they do (late 60's early 70's folk/country rock) with glorious harmonies, top draw musicianship and plenty of charm. Another great festival of live music for a good cause with a fantastic atmosphere and thanks for the invite again.